In early 2012, Velours International approached one of the major leaders in the distribution of sports articles in order to develop a social responsibility department. This society had a negative image due to its being near the 23 slums of the Raposo Tavares and Rio Pequeno neighborhoods of São Paulo, where it had installed a few shops. 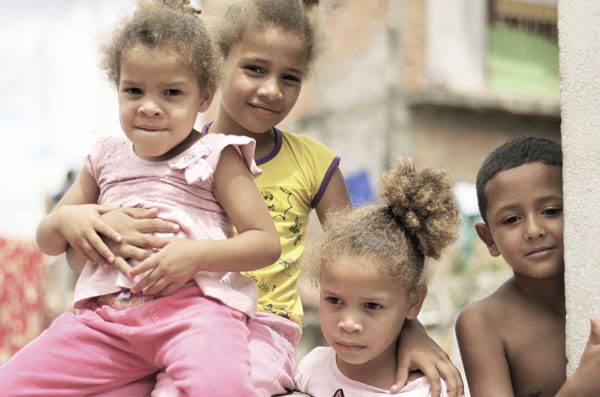 At the end of six months of work, in which we approached leaders of multiple communities, creating tight bonds with the person in charge of Vila Nova Esperança, a destitute community that emerged in the late 1960s in the São Paulo southeast region. Currently pacified, the community houses about 500 families and still suffers from the lack of primary resources such as basic sanitation, regulated electric power and garbage collection, besides fighting eviction processes in the meantime. Although the association lacked structure and funding, it also had ambitious projects. With the goal of becoming the first "Lasting" community in Brazil, Vila Nova Esperança took part in multiple significant ecologic programs. In 2015, Velours International, through fundraising, built a park for the children of Vila Nova Esperança. The choice for the construction of a park was made considering that over 600 children live in the slum and had no room to play. The park is intended to become a meeting place, but also a means of sensibilization towards the environmental issue, recycling, and sustainable development. The French foundation GoodPlanet was an essential partner in the achievement of the project and in making the dreams of Vila's children come true. GoodPlanet is an NGO founded in 2005, recognized worldwide for taking part in multiple sustainable developments and environmental preservation projects. The park was developed under the supervision of LAO Engenharia, a construction company engaged in sustainable development. All materials used in the construction have an ecologically sustainable seal. Garbage collection is one of the greatest issues in the community. There is no public infrastructure for trash disposal, which ends up thrown onto the street by the population, and thus an unhealthy environment. Velours International, in a partnership with the company Tecnisa, provided multiple trashcans and assured the proper installation in multiple community sites, allowing the resolution of the garbage disposal issue, resolving a problem of year, in a few months.